Washington (AFP) – The United States said Wednesday it was quitting an international accord related to the top UN court after the Palestinians challenged the US move of its Israel embassy to Jerusalem. It was the latest attack on the international justice system by the administration of President Donald Trump, who last month at the United Nations virulently rejected the authority of the International Criminal Court. Trump’s national security adviser, John Bolton, said the United States was pulling out of a protocol concerning the separate International Court of Justice in The Hague, which considers disputes between nations. “This is in connection with a case brought by the so-called state of Palestine naming the United States as a defendant, challenging our move of our embassy from Tel Aviv to Jerusalem,” he told reporters at the White House. Bolton said the United States was leaving the 1961 Optional Protocol and Dispute Resolution to the Vienna Convention, which establishes the International Court of Justice as the “compulsory jurisdiction” for disputes unless nations decide to settle them elsewhere. 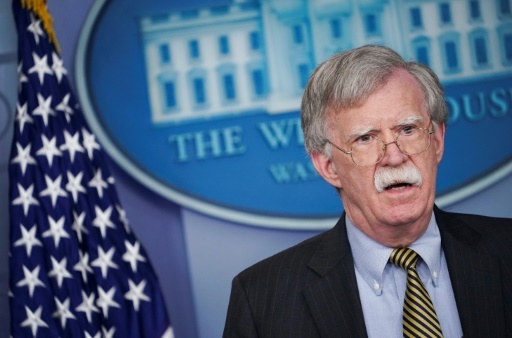 The United States will still remain part of the underlying convention that established the International Court of Justice and “we expect all other parties to abide by their international obligations” on it, Bolton said. Trump last year broke with longstanding international precedent and declared Jerusalem to be the capital of Israel, shifting the embassy. The move — long resisted by previous US presidents who hoped to reach a negotiated settlement — outraged Palestinians who want the holy city as their capital. The Palestinian leadership said Saturday it had filed a lawsuit at the International Court of Justice over the embassy move, calling it a violation of international law. The UN General Assembly in 2012 recognized the Palestinian Authority as a non-member observer state, paving the way for it to join international courts. It was the second withdrawal in one day announced by the Trump administration. Earlier Wednesday, Secretary of State Mike Pompeo said the United States was terminating a 1955 friendship treaty with Iran reached under its pro-Western shah. Iran cited the treaty as it sought an end to renewed US sanctions imposed by Trump, who has left an accord on curbing the clerical regime’s nuclear program. The International Court of Justice ruled that the United States was required to allow shipments of humanitarian goods such as medicine, an exemption that Washington insists it has already allowed. “Instead, the court allowed Iran to use it as a forum for propaganda,” he said. Featured Photo: AFP / Mandel NGAN. Donald Trump’s national security adviser, John Bolton, said the United States was pulling out of a protocol concerning the International Court of Justice in The Hague, which considers disputes between nations.